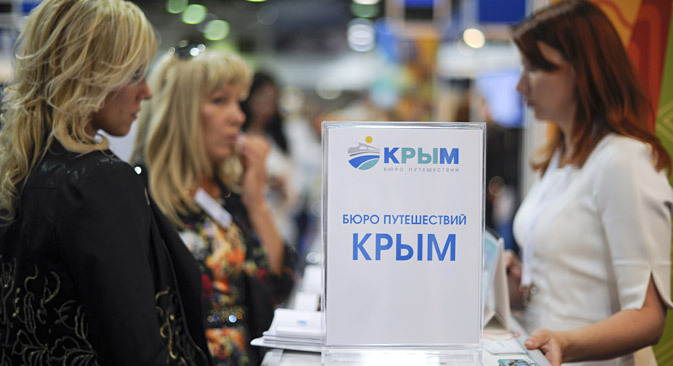 In order to shore up the tourism industry in Crimea, which may lose a significant number of foreign visitors, the Russian government will subsidize trips for employees of state companies as well as schoolchildren and retirees. The Russian government has launched a large-scale program aimed to promote tourism to Crimea and develop the local tourist sector. Historically, Crimea was one of the main holiday destinations for Soviet people. It was here that an extensive network of holiday homes and resorts was built. In the late 1980s, Crimea was visited by up to 8 million people a year. Tourism still remains one of the main sources of revenue for the peninsula, although most of them came from Ukraine. In 2010, Crimea received 5.5-6 million tourists, 60 percent of whom were Ukrainians. Given the geopolitical tensions over the region, few of those tourists will be headed to Crimea this summer, and it is unlikely that many Ukrainians will return in the near future. Russia hopes to sell Russian tourists on the idea of Crimea, but this could, too, prove challenging. From January-September 2013, 5.7 million tourists visited Crimea and only one-quarter of these came from Russia. In 2012, the figure was a mere 21 percent. According to preliminary estimates from Crimea’s Ministry of Resorts and Tourism, some 8 million Russian tourists a year are expected to visit the peninsula in the future, including employees of over a dozen major Russian state corporations. These mainly include energy sector giants like Rosneft, Transneft, Rushydro, Gazprom, and Rosatom and their subsidiaries. These companies are ready to fund employee holidays in Crimea. Oil major Rosneft, for example, has offered its staff Crimean tours at discounted prices, while gas giant Gazprom will promote Crimea as destination for its employees along with others, including Turkey. Anna Minina, the managing director of the Otpusk 2.0 travel agency said that the Russian government was also promoting Crimea as a vacation destination in other ways. "This year Crimea will be visited by schoolchildren, retirees and other categories of people entitled to benefits, including vacation vouchers funded by the state. This will ensure demand and keep the resort busy, even if not 100 percent. This year, Crimea is in no danger of having its hotels vacant," Minina said. Three weeks after Aeroflot subsidiary Donavia announced discounted prices on flights from the southern Russian city of Rostov-on-Don to Crimea, tickets on the route were completely sold out. Donavia has already carried more than 5,000 people to Crimea’s Simferopol airport from Rostov-on-Don since opening the route less than a month ago. On Apr. 18, Chechen airline Grozny Avia also launched flights to Simferopol, although so far only an average of 40-50 percent of tickets on each flight have been sold. The main difficulty in developing Crimea as a tourist destination is the boycott of the peninsula imposed by Ukraine and Western countries. Previously, most Russians traveled to Crimea by train, but the rail lines run through Ukraine and as of mid-May, a train schedule from Russia through Ukraine to Crimea had not been approved. Additionally, Ukrainian authorities are encouraging international aviation organizations to discourage flights to Crimea. The International Civil Aviation Organization (ICAO) has already advised European operators to avoid flying through Crimean airspace, prompting the cancelation of flights to Simferopol from European airports, including Vienna and Riga. The most drastic step would be to remove the international flight code of the Simferopol airport off the ICAO and IATA registers as was done with the Sukhumi airport in Abkhazia and Ercan airport in North Cyprus. The European Union has already closed its Crimean Tourism Diversification and Support Project, which was launched in 2012 and had received nearly 5 million euros in allocations. The Russian authorities have so far proposed several solutions to these problems. The first move was to subsidize airfares to compensate for the loss of rail traffic. Similar programs are in place for the Kaliningrad Region, which is cut off from the rest of Russia by Belarus, Lithuania and Poland. "Given possible problems with rail transportation to Crimea, the steps being taken by the Russian authorities to make the peninsula more accessible for tourists look quite effective," said Vadim Vedernikov, deputy head of research and risk management at the investment company UFS. At 7,500 rubles ($216), round-trip, a plane ticket from Moscow to Simferopol is affordable for the majority of the Russian middle class, which is the target of the promotion. According to Anna Minina, many Russians are ready to go to Crimea out of a sense of patriotism. She said that many tour operators are including Crimea into their priority destination lists since the media hype is creating demand for vacations on the peninsula. In April 2014, the business weekly Kommersant Dengi conducted a poll asking about potential vacations to Crimea. Nearly 45 percent of respondents said they had never been to Crimea, but now planned to go; only 8.5 percent said that they had been before, but now would not go again.